All face-up monsters on the field become DARK. Once per turn, if you would Tribute a monster(s) to activate a card or effect, you can Tribute 1 DARK monster your opponent controls as if you controlled it. 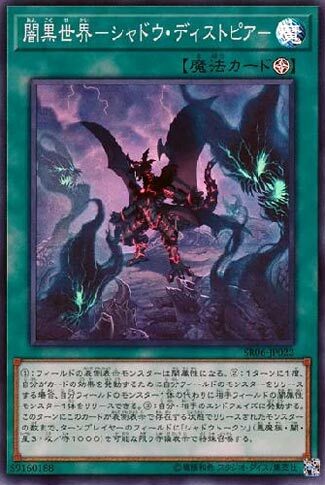 Once per turn, during the End Phase: Special Summon as many “Shadow Tokens” (Fiend/DARK/Level 3/ATK 1000/DEF 1000) as possible to the turn player’s field in Defense Position, up to the number of monsters that were Tributed this turn while this card was face-up on the field. Lair of Darkness is another great Field Spell introduced into the game geared towards Field Spells at the moment. All monsters are now DARK. Attribute-changing effect isn’t going to hurt too much unless your opponent is running Attribute-based support like Honest, but that first effect is key to the second effect. If you need a tribute for any reason, summon, card effect, you get to use an opponents monster instead. This card just became a 1-for-1 on turn one, then a plus every turn after. One monster and once per turn are reasonable restrictions. Free Tokens at the End Phase equal to the monsters tributed this turn just means more monsters to use for tributes, Synchro material, and Link material. The Shadow Tokens have no drawbacks unlike other token-based monsters in the past. Your opponent can use this card as well, and gains the Token plus if the do tribute any DARK monster(s), but the chances they are using DARK-based tribute effects are slim, and if they Tribute Summon you can still counter it with something like Solemn or Torrential. Your field could be filled with your tokens and your boss monster(s) in one turn, pending on how you use Lair of Darkness and your effects. This card facilitates a good amount of the structure deck moves, and could be a fun tech in a tribute-based deck like Monarchs. I mentioned the Field Spell of the deck yesterday and here it is, what this whole Dark deck is focused around really, Lair of Darkness. Lair of Darkness makes all monsters on the field Dark attribute, which will be good for the other effect, as if you would tribute a monster for an effect, you can tribute one Dark monster your opponent controls once per turn. This can be disruptive if you have a quick effect that lets you tribute like Lilith or if you want to use a Virus card. Also, during the End Phase, the turn player will have Tokens that are Level 3 Dark Fiends with 1000 ATK and DEF up to the number of Dark monsters tributed that turn while Lair of Darkness was on the field. Good way to generate tribute fodder for card effects, plus since it is on the End Phase, your opponent can’t use the tokens for Link fodder unless you let any stay on the field, which you shouldn’t do. Lair of Darkness makes this new Dark deck function very well, play 3 of it when using the new Dark support. Art: 4.25/5 Honestly doesn’t get darker than demons surrounding a Dark Dragon. Lair of Darkness, appropriate enough in such a Structure Deck, adds another playable Field Magic to the game of Yugioh. So first off, all Monsters on the Field become Dark. I like this, as Dark obviously has an asinine amount of support, and this only adds more fuel to that fire. This, much like yesterday, revolves around Tributing Dark Monsters, although you’re given the opportunity to use your opponent’s instead. Obviously this is fantastic for the player, still combos well with the Virus cards via the Tokens this produces, and your opponent likely isn’t going to get much use out of this card for themself. I really do like the speed of this new Structure, and it’s hard to rate, based (again) on how combo oriented so much of these cards are, despite the fact they should be able to work well enough on their own.